Quick and easy to make, filling and nutritious to eat, it’s…. Dalia Upma! “Dalia” refers to broken or cracked grain, and wheat dalia is the most readily available type. “Upma” is a south Indian staple breakfast dish that is often made with semolina (finely ground grain, again usually wheat). Wheat dalia is easy to cook and has a nutty, chewy texture. It’s a complex carbohydrate that releases energy at a slow rate and will keep you satisfied till lunchtime! Dalia Upma is often made with onions and vegetables. In this post, I’d like to share with you a variation of this breakfast dish. In this version, instead of vegetables, I’ve used almonds for protein and crunch, and sesame seeds for the aroma as well as the calcium, iron, and vitamin B-6. This recipe is suitable for diabetics, weight watchers, and sesame fans! 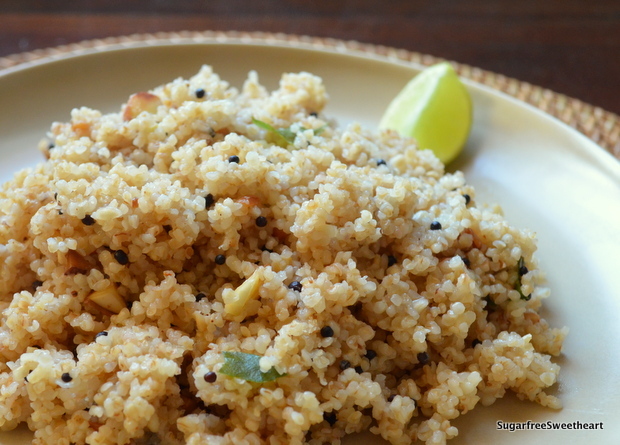 Check on the upma while it is cooking and give it a stir or two to help distribute the heat and cooking water. Add slightly more water and cook for a couple of minutes extra if you prefer your upma less fluffy, softer, and more creamy. With all these cupcakes I was missing thi delicious recipe. I’m going to try out also the one withe veggies… and a lot of garlic, of course! My favourite….. its the best morning breakfast ….. I love your pictorial presentation always…. how do you do that???? I draw the pictures by hand, then scan them and colour them with Photoshop and then put in the text.. It takes quite a bit of time so that’s why my blogging speed is still so slow! So glad you like the illustrations! Yay!